• Randall Balmer, The Making of Evangelicalism. From Revivalism to Politics and Beyond. Focuses on “four great turning points” in the history of evangelicalism: the Great Awakenings, the nineteenth-century shift to premillennialism; the 1925s Scopes trial; and the rise of the religious right. • Catherine Brekus and W. Clark Gilpin, eds., American Christianities: A History of Dominance and Diversity. Features essays about the diverse nature of Christianity in America—by race, gender, geographical location, theological approaches, and social concerns. • Roger Finke and Rodney Stark, The Churching of America, 1776–2005: Winners and Losers in Our Religious Economy. Finke and Stark are perhaps the most famous modern popularizers of the thesis that diversity in the religious marketplace causes religion to thrive, and this book uses the last few centuries of American religious history to explain why they feel this is so. • James Fisher, Communion of Immigrants: A History of Catholics in America. Surveys Catholicism’s progress through, and impact on, American history, with attention to its cultural and ethnic diversity. • Richard Hughes, ed., The American Quest for the Primitive Church. Explores how many different religious traditions in America—from Mormon to Baptist—have sought to restore primitive Christianity, and the wide diversity of the results. • Martin Marty, Pilgrims in Their Own Land: 500 Years of Religion in America. This survey history of American Christianity highlights the personalities and the waves of migration that have shaped its story. • Charles Morris, American Catholic: The Saints and Sinners Who Built America’s Most Powerful Church. This comprehensive history of Catholicism in America includes its current challenges. • National Humanities Center, “Divining America: Religion in American History,” www.national humanitiescenter.org/tserve/divam.htm. Over 30 brief essays explore how to teach (and learn about) various aspects of American religious history, each with copious links to further resources. • Thomas Kidd, God of Liberty: A Religious History of the American Revolution. Explores how evangelicals and deists cooperated in the revolutionary era in the service of a belief that religious freedom and diversity were important to the early republic. • James Smith, “The Father of California” (issue 35). “On the morning of July 16, 1769, on a windswept hillside overlooking the Pacific Ocean, Father Junipero Serra celebrated High Mass before a hewn wooden cross. 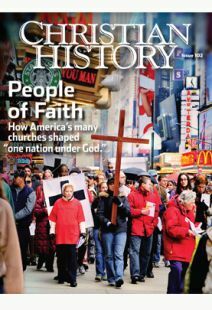 The Mass signaled the sunset of Spain’s mission colonization of the New World but the dawn of Father Serra’s greatest work.” See also “Highlights of the California Missions” (Mark Galli) and “Christianity Comes to the Americas” (William Taylor) in the same issue. • Harry Stout, The Divine Dramatist: George Whitefield and the Rise of Modern Evangelicalism. This biography of George Whitefield highlights how much he contributed to the ethos of modern evangelicalism and how his theatrics prefigured the rise of modern televangelism. • Harry Stout, “Heavenly Comet” (issue 38). “By 1750 virtually every American loved and admired Whitefield and saw him as their champion. … Whitefield’s mode of revivalism—theatrical, passion-based, non-denominational, international, experience-centered, and self-consciously promoted through media—outlived him. Whether or not they knew it, generations of evangelical revivalists, chaplains, youth and student parachurch leaders, and religious philanthropists followed a trail first blazed by George Whitefield.” See also “The Religious Odd Couple” (Frank Lambert) in the same issue on Benjamin Franklin’s friendship with Whitefield. • R. Laurence Moore, Selling God: American Religion in the Marketplace of Culture. Merchandising of religion is nothing new, and this book is a history of attempts at it since the beginning of the nineteenth century, from George Whitefield to Brigham Young to P. T. Barnum to Fulton Sheen. • Jackson Carroll, Mainline to the Future. Argues for the continued vitality of the mainline tradition, but also maintains that it needs to adapt to the changes surrounding it in modern society. • Elizabeth Hill Flowers, Into the Pulpit: South­ern Baptist Women and Power Since World War II. Reveals the complicated history of women in the Southern Baptist Convention during the growth of conservative power in the church. • Donald Miller, Reinventing American Protestantism. Though several decades old now (before the prominence of the emergent church), this book traces the rise of “postmodern traditionalist” and postdenominational megachurches and the way they have transformed the American religious landscape. • Christian Smith, American Evangelicalism: Embattled and Thriving. This detailed sociological study explores who modern evangelicals are and how they not only have survived, but continue to thrive, in modern, pluralistic America. • Grant Wacker, Heaven Below: Early Pentecostals and American Culture. This is a comprehensive and sympathetic history of one of modern America’s major, and thriving, religious movements.